Massive trade deficits have been the fundamental weakness in the balance of payments and the underlying reason for balance of payments crises. Large remittances from abroad and significant earnings from tourism have been the strengths in the balance of payments. However, these remittances from abroad and earnings from tourism that offset the trade deficit have been weakening this year. The emerging balance of payments situation is of serious concern. Despite the surge in exports from March this year, the gains in export earnings have been offset by larger import expenditure. 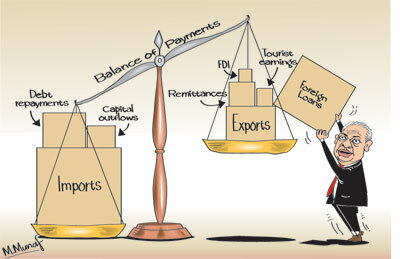 The trade deficit that expanded to as much as US$ 2.5 billion in the first quarter has widened still further in April. Most worrying is the fact that the two buoyant sources of earnings have also turned unfavourable. The uptrend in both workers’ remittances and tourist earnings has decelerated this year. This weakening of the two major strengths of the balance of payments that have offset the large trade deficits of recent years is a severe setback. An improvement in the balance of payments could be expected only if the current growth in exports gains momentum and there is containment in imports. The reduction of the trade deficit has become imperative owing to the slow growth of workers’ remittances and tourist earnings. The balance of payments is likely to deteriorate, if the trade deficit increases and workers remittances and tourist earnings do not increase. Although the Central Bank has attributed the decrease in tourists to the closure of the airport early this year, there is increasing evidence that the tourist decline is owing to other reasons. Chief among these is the dengue epidemic. There have also been travel advisories regarding the floods, violence against tourists and communal and religious violence. The latest information is that tourist arrivals picked up in June and grew by 4.5 per cent. During the first half of this year, tourist arrivals increased by 4.8 per cent to one million arrivals. However it is somewhat optimistic to expect the uptrend in tourist arrivals to continue at a pace to achieve this year’s target of 2.5 million. If tourist earnings could at least be that of last year’s US$ 3.4 billion it would be a significant contribution to the balance of payments. The large trade deficits in the last three years were due to imports growing while exports decreased. Export earnings decreased by 5.6 percent in 2015 and by 2.2 percent in 2016. Export earnings are only about 55 percent of import expenditure. Consequently trade deficits reached US$ 8.3 billion in 2014 and increased to US$ 8.4 billion in 2015. It ballooned to US$ 9.1 billion in 2016. This deterioration in the trade balance accelerated in the first four months of this year indicating that this year’s trade deficit might exceed US$ 11 billion. This trend continued till February this year. Since March there has been a surge in exports. There is a possibility of the trade deficit being contained below US$ 10 billion, if the spurt in exports of both agricultural and manufactured exports in March, April and May of this year accelerates. On the other hand, imports have grown rapidly to counteract the export growth. Imports have been increasing in recent years at a much higher rate than exports. The increase in imports by 19.4 percent in the first quarter of this year is an unprecedented rise. While all categories of imports increased, the highest increase was in intermediate imports. An 82 percent increase in fuel imports was mainly responsible for this escalation. The much improved rainfall should reduce fuel imports for thermal generation. On the basis of the first quarter’s trade deficit of US$ 2.5 billion, the end-of-the-year trade deficit may reach as much as US$ 10 billion. Tentative data indicate that the trade deficit has widened further in April. This is despite an improvement in exports in March, April and May. The trade deficit could expand further during the second half of the year, if the surge in imports continues. As indicated earlier, the balance of payments has had two setbacks in the first quarter of this year and they would hopefully be reversed. First, remittances have decreased by 3.3 percent to US$ 1.7 billion from US$ 1.8 billion in the first quarter of last year. This is the first time in recent years that remittances have not increased. Second, the recent high growth in tourist earnings decelerated in the first quarter of this year. Tourist earnings increased by only 3.4 percent in the first quarter compared to the same period of last year. However there was an increase in tourist arrivals in June and the increase in tourists in the first half of the year was slightly higher at 4.3 percent. Hopefully tourist earnings would revive during the rest of the year. All things considered, the emerging balance of payments situation is alarming. The trade deficit could balloon to US$ 10 billion or more. The sluggishness in the growth of remittances and tourist earnings would mean that this large trade deficit would not be offset by these earnings. An improvement in the balance of payments could be expected only if the current growth in exports gains momentum and there is containment in imports. The reduction of the trade deficit has become imperative owing to the expectation of workers remittances and tourist earnings rising are most unlikely. While the weaknesses in the trade balance continue, the two strengths in the balance of payments are weakening. The growth in remittances and tourist earnings has been arrested. Export growth in March and April gives a glimmer of hope, but import growth has already offset this advantage. However these two strengths of the balance of payments have been weakening this year. Hopefully there would be a revival of the increasing trend in workers’ remittances and tourist earnings.